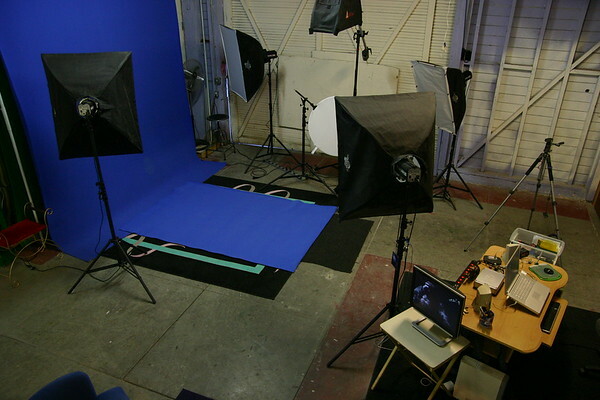 Chroma key is often referred to as "blue screen" or "green screen" photography, because of the frequency of those colors being used as backdrops. 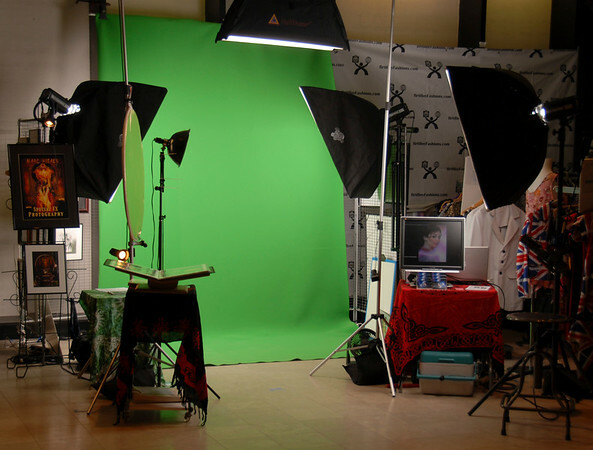 Chroma key is the process used to insert a new background behind a model or object. The subject is photographed against a background of a single color. The backing screen is typically a blue screen or green screen, the two colors that contrast most to human flesh tones. Then that single color is removed digitally. When the solid color is digitally extracted, the masking process leaves transparency (blank space) around your subject. The important point is that once the solid color background (in this case, blue or green) is removed, you can insert any imagery you want in its place. This is often referred to as "pulling a key". A key is the blank area, technically called an "alpha channel" that is created when the solid color background is removed. The most common example of chroma keying is the TV weather program. A TV weather person is shot in front of a blue/green screen. A computer then removes the solid blue background and replaces it with a weather map, or any other image or background scene in its place. One of the more important areas to spend a few more dollars on, is putting it towards quality chroma key screen materials. You start off with good equipment and it will work with you, not against. Some businesses sell material that are shiny (has a sheen), and then there is material that absorbs the light better (no sheen / matte) because is it spongy like with a padded backing. This type of material is around 1/4 inch thick. Very heavy duty material, less wrinkle problems, and material can be cleaned. It's the spongy thicker material that absorbs the light that you should consider purchasing. You do not want to have a material that is shiny, allowing your lighting to reflect and bounce back onto your subject. When the green or blue screen reflects onto your subject it is referred to as"Spill". I work with both "Green and Blue" screen background materials. Green screen is going to be used more often over a blue screen. Since green is not a color found commonly on the human body (eyes, skin) and people wear less clothing colored green over blue. 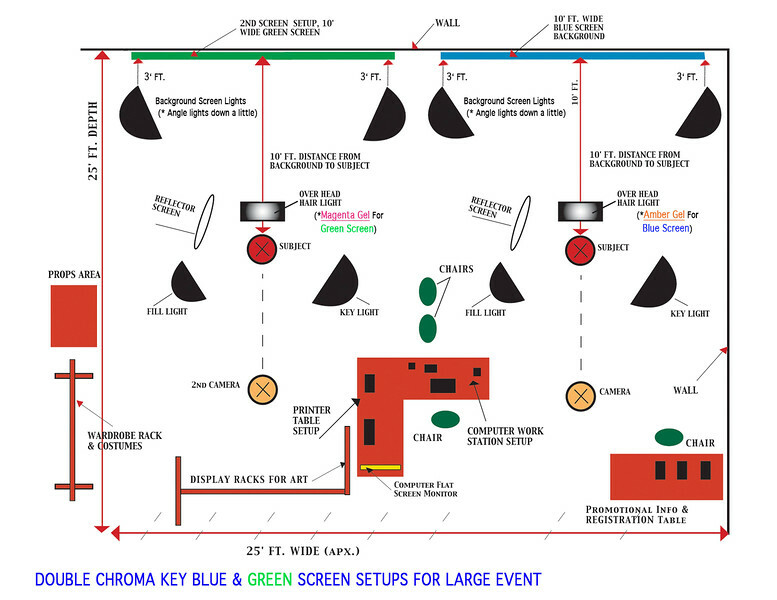 I use (2) large chroma key screens at 10 ft. x 14 ft. (blue & green), and (2) smaller chroma key screens at apx. 5 ft. x 7 ft. Having in your inventory a black and white backdrop will come in handy also. If you have (2) two lights use them to evenly light your entire screen background. Each light is placed on either side of the screen background. At an apx. distance of 3 ft. from the screen itself, aiming towards the center. When you position your strobe lights or continuous lights, make sure they are not pointing straight at the screen (at 90 degree). This is because if you point them straight at the screen, the lighting will reflect/bounce straight back and tend to "spill" onto your subject, giving you undesirable results, and making your chroma key software work harder. By angling the lights down onto your screen background (maybe at apx. 70 degrees), you will help reduce the "spill factor" onto your subject. * Lighting rule for your background screen is one F-Stop less (darker) than your subject. So your screen is a touch darker and your subject is a little brighter!!!. I have (5) five strobe lights, but will purchase continuous lights in the future. I use (2) two lights for my screen background, (1) one hair light on a boom, and (2) two lights for my subject (key light and fill light). Back in the day most continuous lighting for sale produced high temperatures due to the type of bulbs used. Nowadays they are manufacturing affordable fluorescent lighting bulbs that are low temperature and produce little heat, making for a happier client and cooler studio. What you see is what you get using continuous lighting. Also if you are into pet photography, then animals are more at ease in general with continuous lighting, compared to when a light is flashing in their eyes (strobe). When possible use (3) three lights with soft boxes. (1) "Key Light" (main), (1) "Fill Light", and an (1) over head "Hair Light", and reflectors (*foam core works also). *"HAIR LIGHT" : A hair light produces nice results and can give you that extra light source look. This extra light can make you subject blend better seamlessly with your background art image scene choice. Also having a (5th) fifth hair light can help reduce the "green & blue screen spill factor" onto your subject. When needed a colored gel will help counter act (reduce) the "green & blue screen spill factor". Place a colored gel over your hair light soft box. The rule of thumb for colored "Gels" is, use an "AMBER COLORED GEL" when using a blue screen background material. 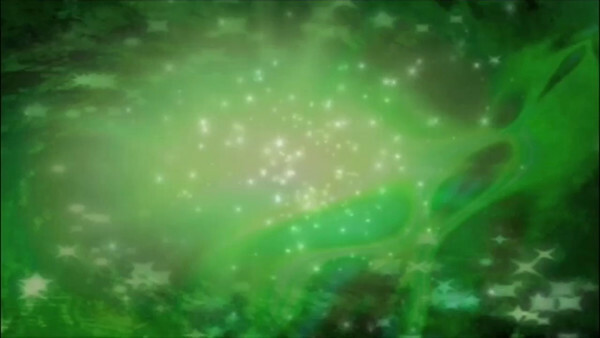 And use a "MAGENTA COLORED GEL" when using a green screen background material. Basically the colored gels are canceling or neutralizing each other, being they are the opposite colors on the color wheel. You do not have to use colored gels as a rule. Of course the "Amber Gel" produces a deeper golden look, etc. Try to always have on hand these two colored gels, as sometimes they may really come in handy (maybe save the day), especially when you find yourself cramped for a setup space, and your subject is just way to close to the chroma key background screen. The ideal distance from the back of your subject to the chroma key background screen is (10 ft.) ten feet. (8 ft.) Eight feet is also ok, it's when you start to close that gap from there is when the "spill factor" potential creeps in. 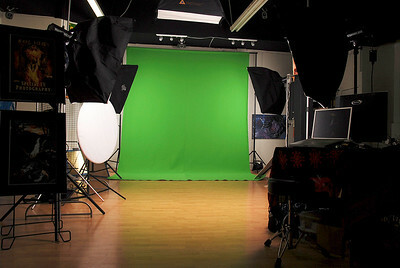 If you have your own studio then you can spread out your equipment as you like and get the best results. On location event photographers are not as likely to be granted large display areas for you to setup your on site photography chroma key studio/booth. Just know that the closer your subject to the chroma key background screen, the more likely the green or blue screen color will "spill" onto your subjects hair, body and props used. Doing full length portrait chroma key photography has more challenges than when you are just shooting head shots, waist up and from the knees up. 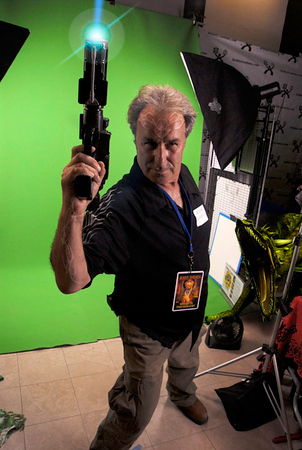 When you are shooting full length, you will have a chroma key screen under your subject as they stand on it. Now you have an additional automatic spill factor built into your shooting/lighting formula. You may still need to do some additional post editing (removing spill and or doing a garbage mask) in a photo editing software program like Photoshop when shooting a subject full length. Always keep in mind the type of props or material (clothing & accessories) people wear at a photo shoot, whether in studio or on locations. Leather in general (shoes, belts) are shiny or reflective and pickup the green or blue screen colors. So does jewelry or chrome on wheels, swords or painted surfaces on cars. These types of materials are like mirrors, reflecting objects and light around them. For people: If you are out of extra lights, that's ok, try using reflector screens to bounce your lighting onto the lower areas of the subject. Or just go to your local art supply store and purchase some white foam core. For optional effects you can buy gold (metallic / reflective) matte paper stock and glue it onto the foam core for additional strengthening and use it for a colored gold reflective screen. Bounce this additional reflector light onto your subject a little from behind them, not straight from their side. This will also help with any "spill" coming from your background chroma key screen, that would effect the lower portion of your subject (feet area, etc.). 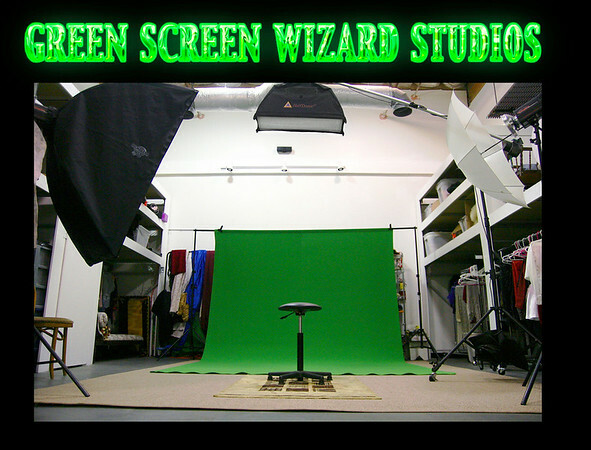 Chroma Key Photo Shoot / Video collaboration project at "Green Screen Wizard" studios. 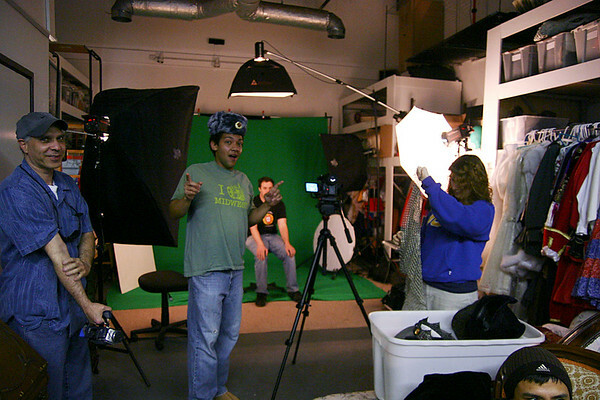 The project was filmed at "Green Screen Wizard Studio's", using chroma key green screen. All artwork designs & graphics for this project were my own original artwork. In this video you will see the original model photography images are turned into artwork, as a before and after art vision materializes before your eyes! This model photo shoot/video was such an awesome artistic collaboration project, all the professional friends that came together as one creative army made me very proud to have had the pleasure of working with! My gratitude and from my heart Thank You all for making my idea and dream come true!!! Video editing, graphic designs and original artwork, by "Marc Kitaen" / Produced by "Craig Wilson" of Mental Ecletic" / Videographer "Chris Hickey"/ Motion Graphics original intro and sound effects by "Alan Brock". Special thanks to the entire crew who made this all come together beautifully: Craig Wilson of "Mental Eclectic" (Producer) / Michael Lee of "A Style Coincerge", for sending us (2) Professional Hair Stylists & Make up artists: Amber Kannar , and Dan Omar / Professional Hair Stylists & Make up artist Miranda Jean / Chris Hickey (Videographer) / Alan Brock (opening intro motion graphics & soundtrack) / Kat Casna (production) / Amy Kaczmarek (wardrobe), Models: Kat Casna, Erin Edwards, Stella Dacy, Amber Kannar, Byron Stevens and Manny Silveria. From Top Left to Right photos: My former Green screen photography studio / "Special FX Photo" at "Avalon Productions" (now Queen Bee's), located in North Park San Diego. From Bottom Left photo: On location for the "Comic Con After Party" green screen photography studio setup. 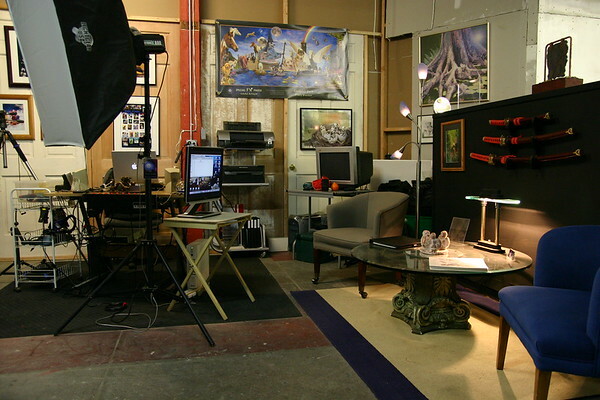 Bottom Right photo: At "Green Screen Wizard Studios", located in the Miramar area, San Diego, CA. Over one thousand props and wardrobe.